A letter from Frederick P. Gaske, a Florida State Historic Preservation Officer, to Bill Vogel, Superintendent of Seminole County Public Schools, dated October 30, 2006. 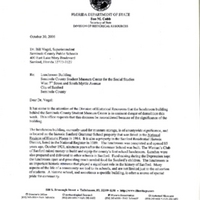 In the letter, Gaske addresses the danger of the demolition of Sanford Grammar School's historic lunchroom building, explains the importance of preserving the structure, and offers suggestions to Vogel in regards to saving the building via grants. Original letter from rederick P. Gaske to Bill Vogel, October 30, 2006: Sanford Grammar Collection, Archives Box 4B, UCF Public History Center, Sanford, Florida. Digital reproduction of original letter from rederick P. Gaske to Bill Vogel, October 30, 2006. "Facsimile from Myriam Garrett to George Kosmac (October 16, 2007)." RICHES of Central Florida. https://richesmi.cah.ucf.edu/omeka/items/show/4708. Originally created by Frederick P. Gaske. “Letter from Frederick P. Gaske to Bill Vogel (October 30, 2006).” RICHES of Central Florida accessed April 24, 2019, https://richesmi.cah.ucf.edu/omeka/items/show/4709.